If you’re a fan of Call of Duty, then you might want to read this update. We’ve got plenty news and sales to keep you busy. There’s also plenty for you, even if you aren’t a big fan of COD, with Batman, GTA, Battlefield and Xbox One. Flatty will be hosting a Community Game Night in Call of Duty: Black Ops II this Saturday November 16 at 6pm EST. During this event we’ll be playing Grief on Cell Block. Will you be able to demonstrate your hoisting abilities and outlast the other team? Prove it by signing up in this thread and being online at the start time. Hope to see you there! This week in the Achievement Guide Spotlight, we’re talking a look at our guide by Flatty and Trysten for the Lost Little Girl achievement in Call of Duty: Black Ops II. Like the other iterations of this series, these guides are designed for players to unlock the covered achievements with a minimal amount of pain and suffering. “Lost Little Girl” is the easter egg achievement that can only be earned on the Origins zombie map in the Apocalpyse DLC for Call of Duty: Black Ops II. The guide includes a description of the steps required to unlock the achievement. The locations of the parts for the elemental staffs and steps on how to upgrade them are also included in this guide. An easier way to go for the achievement is to enlist the help of Team Deathmachine, our achievement team dedicated to slaying zombies and exposing easter eggs. All you need to do is post here with what you need and the times you are available to play. 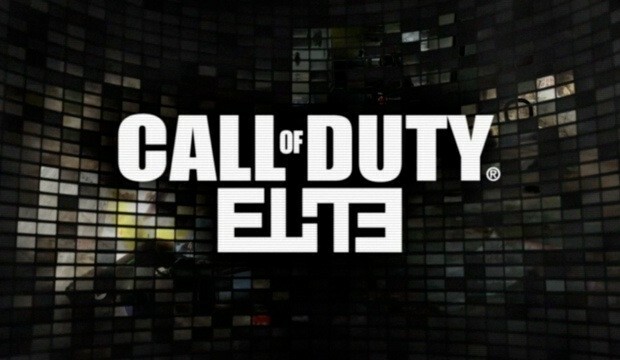 In preparation for the release of Call of Duty: Ghosts on November 5th (for the current-gen consoles and PC), Activision is turning on Double XP for a full week in Call of Duty: Modern Warfare 3 and Call of Duty: Black Ops 2. 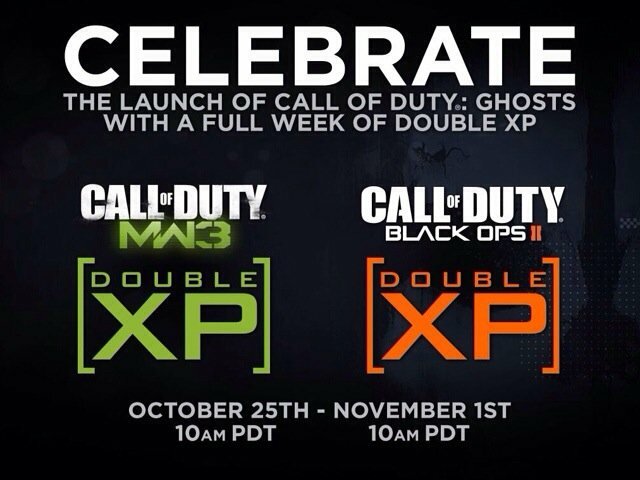 The Double XP Week will start on Friday, October 25th, 2013 at 10 AM PDT and end next Friday, November 1st, 2013 at 10 AM PDT. The Achievement Guide Spotlight is a weekly feature where we take a look at one of the achievement guides written by members of SIP. These writers have plenty of experience in unlocking these achievements and are often members of our elite achievement teams. The guides should be followed in order to minimize the pain and frustration in trying to grab these achievements. While the guide is very detailed, there often is no replacement for in-game help. To get such help, be sure to enlist the help of our dedicated Black Ops Zombie team, Team Deathmachine. It’s a party and Zombies are invited… TO DIE!! Zombies, zombies, zoooommmbeeeezzzz!!! This article features all things “Zombies!” From team members, to Milestone achievements, to recruiting. If you are alive, and like to kill the undead, take a gander at the updates with Team DeathMachine. First off, if you weren’t aware already, I would like to formally announce that Team DeathMachine Captain, TangoDown, has resigned. He, along with other former members, were great assets to building the team to what it is today. His screaming will be dearly missed. Unfortunate for us, fortunate for him, he has chosen to pursue RL dreams… What a selfish guy… LOL! J/K! We all wish you the best, Mike! 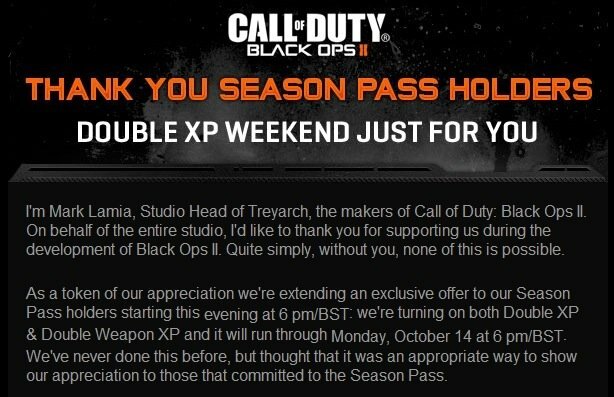 This weekend, Treyarch will turn on Double XP and Double Weapon XP in Call of Duty: Black Ops 2 for those members who bought the BO2 Season Pass. Treyarch is doing this in appreciation of all their dedicated fans who supported them through the development of Call of Duty: Black Ops 2. The Double XP weekend starts right now (Friday, October 11th, 2013) from 1 PM ET and goes till Monday, October 14th, 2013 at 1 PM ET. You must have downloaded a season pass to your account in order to take advantage of the Double XP. Happy Gaming!